NIU’s Department of Kinesiology and Physical Education is hosting a free Try SCUBA program Saturday, April 27, for persons with disabilities and their families. The NIU College of Education’s Department of Kinesiology and Physical Education (KNPE) will host a Try SCUBA training program Saturday, April 27, for persons with disabilities and their families. Try SCUBA is presented by the Freedom Divers International Foundation (FDI). The event is free and open to the community. It will take place from 10:30 a.m. to 4:30 p.m. at the Anderson Hall pool on campus. Participants are asked to pre-register for the 30-minute one-on-one sessions, which will be scheduled throughout the day. 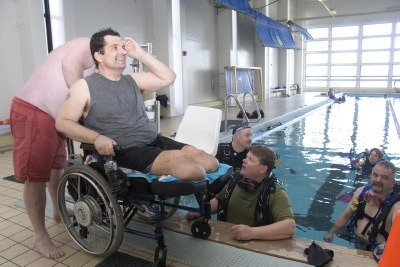 Before forming the foundation, Kurt Clifton, FDI president and CEO, along with the organization’s founding members, offered Try SCUBA programs to wounded military veterans. Since 2003 they have helped more than 100 soldiers and their family members participate in the Upper Keys Warrior Dives held semi-annually in Key Largo, Fla.
Karen Clifton, a member of the FDI teaching staff, also works for NIU as a police officer and paramedic. Jordan Clifton, a freshman at NIU, is a certified IAHD Dive Buddy with the program as well. For more information, or to sign up for a session, call (815) 528-7753 or email info@freedomdiversinternational.org.